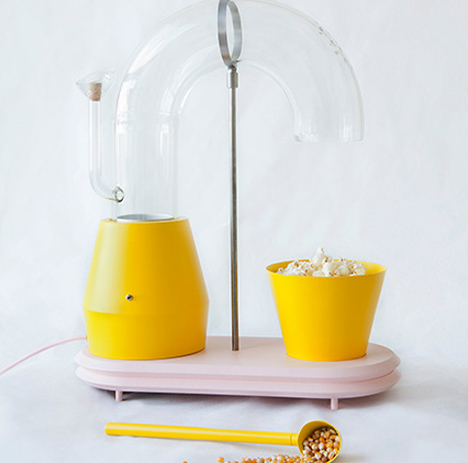 In the 1971 movie Willy Wonka and the Chocolate Factory, Gene Hackman’s delightfully insane confectioner promised his visitors: “Come with me and you’ll be in a world of pure imagination.” That pledge was the inspiration for designer Jolene Carlier’s Popcorn Monsoon. 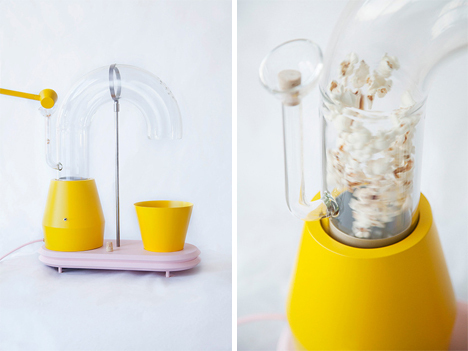 The Popcorn Monsoon is a hot air popper with a whimsical design. The motor and heater rest in a bright yellow casing. Popcorn kernels are poured into a little glass funnel where they drop down into the heating chamber. Although hot air popcorn poppers have been around for decades, Carlier’s version is quirky and cute. 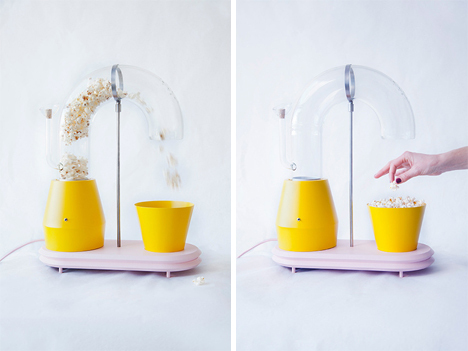 It gives you a view into the inner workings of how the popcorn is popped as it swirls around and is eventually pushed through the clear tube and into the waiting bowl. Carlier’s design takes a mundane machine and turns it into an entertaining gadget that everyone can enjoy. And because air-popped popcorn is a healthy treat, it won’t contribute to tooth decay like Willy Wonka’s sweet offerings. Sadly, the Popcorn Monsoon is a concept at the time and the designer has not announced any plans to produce it commercially. See more in Industrial Design or under Technology. February, 2015.